BOSTON, Mass. 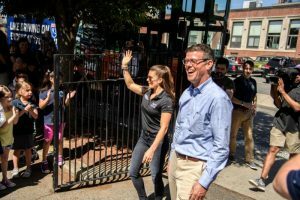 – Danica Patrick won’t ever forget this visit to Boston. The NASCAR driver started her day at Warren Prescott K-8 School, took a student-led tour of the city on an authentic Boston trolley, rode a swan boat in Boston Common, and closed out her day with a stop at the iconic bar, Cheers. The New England visit comes one month ahead of the Overton’s 301 Monster Energy NASCAR Cup Series race on July 16 at New Hampshire Motor Speedway. Patrick began her day amidst a chorus of 500-plus elementary students cheering “Da-ni-ca, Da-ni-ca!” The Warren Prescott K-8 School welcomed the NASCAR pilot with a student-led song, “Best Day of Our Life,” and drumline. Patrick thanked the students, who gave her a T-shirt to commemorate the day. She reciprocated by giving every student in the school tickets to see her race in the Overton’s 301. Patrick, eight girls from the school, and the speedway’s social media winner (a five-year old girl from Topsfield, Mass.) then boarded a Boston trolley, decked out with New Hampshire Motor Speedway logos and graphics. The students gave four different presentations to Patrick about the history of the city while aboard the trolley. The trolley also made stops at Bunker Hill, the Samuel Adams statue behind Fanueil Hall, and Boston Common, where she rode a swan boat with the students. Patrick closed out her day with a stop at Cheers, where she conducted media interviews and filmed a social media spot for the speedway’s social media team loosely based off the hit TV show, “Cheers”. David McGrath, the speedway’s vice president and general manager and a native of Marlborough, Mass., played the role of bartender in the shoot, hitting the Boston accent spot-on. Anyone that purchases $10 kids tickets for the Overton’s 301 before the June 30 deadline will be entered to be randomly drawn into an opportunity to take part in a kids Q&A with Patrick at NHMS before the Overton’s 301 on July 16. To purchase kids tickets and to see Patrick in the Overton’s 301 on July 16, please stop by Fan Relations, visit the speedway website at www.nhms.com, or call us at (603) 783-4931. I love Danica Patrick. I think she is beautiful. I love the way she drives. I root her on every Sunday when she races. She is without a doubt my favorite driver.